Theresa May has sought to reassure world leaders that her Brexit deal is "good for the global economy". She said they were "keen" to sign free trade agreements and wanted certainty, which she pledged her deal would bring. Asked about her legacy as PM, she said there was "a lot more for me still to do, not least being the prime minister that does take the UK out of the EU". The G20, which this year holds its summit in Buenos Aires, is made up of the 19 of the world's most industrialised nations, plus the European Union. It accounts for 85% of the world's economic output and two-thirds of the world's population. 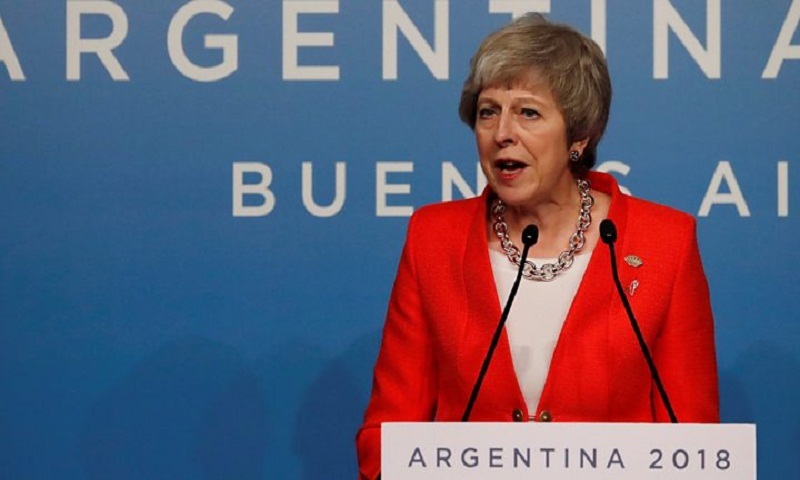 "For the first time in more than four decades, the UK will have an independent trade policy," she told reporters at a press conference. "That this deal sets a path for the UK to a brighter future has been affirmed by the discussions I've had on trade over the past two days with friends and partners making clear that they are keen to sign and implement ambitious free trade agreements as soon as possible." The summit came as another government minister, Sam Gyimah, resigned over Mrs May's Brexit deal, saying he would vote against it when the agreement goes before Parliament on 11 December. Asked about the situation back in the UK, Mrs May said: "The next nine days are a really important time for our country leading up to the vote on this deal. "I will be talking with members of Parliament obviously and explaining to them why I believe this is a good deal for the UK. "Why it is a deal that delivers on Brexit but it is also a deal that protects jobs and the economy and why passing this deal in the vote that takes place in the House of the Commons will take us to certainty for the future, and that failure to do that would only lead to uncertainty. "What I've been hearing here at the G20 is the importance of that certainty for the future." Mrs May held one-to-one talks with the leaders of Australia, Canada, Japan, Turkey and Chile. The Japanese prime minister, Shinzo Abe, urged her to avoid a no-deal Brexit. Major Japanese companies such as Nissan - which employs 7,000 people at Britain's biggest car factory in Sunderland - and Honda are concerned about the possible impact on their supply chains across Europe. She said told him she was confident Japanese businesses in the UK would continue to trade well with the EU. Mrs May also held talks with Australian Prime Minister Scott Morrison, who praised her "great determination on one of the most vexed issues I think there is". The prime minister was also quizzed about her meeting with the Saudi Crown Prince Mohammed bin Salman - who she shook hands with - on Friday. She did not say whether she had confronted him directly over the murder of journalist Jamal Khashoggi at Saudi Arabia's consulate in Istanbul in October. "What I said to the Crown Prince yesterday was the importance of a full, credible and transparent investigation that identifies those who were involved and the importance of ensuring that those who were involved are held to account," she said. "That is the message we have consistently given since the terrible murder of Jamal Khashoggi and it is a message we will continue to give."